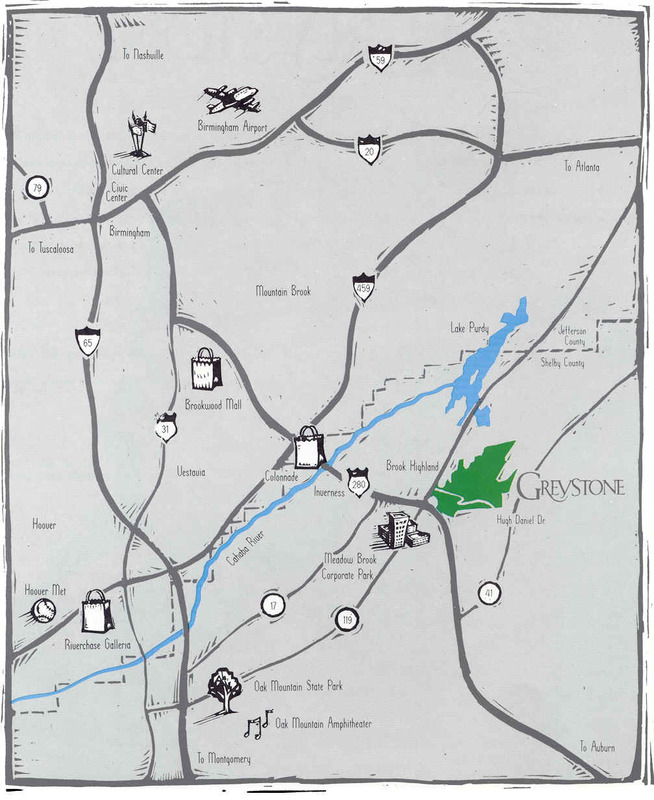 Greystone is a master planned community in North Shelby County, just south of Birmingham in the most growing area of the region. The community is gated which provides a secluded atmosphere for you to enjoy the parks, golf course, swim & tennis facilities, lakes, playgrounds, walking trail, and natural areas throughout this 2,000 acre development. The community receives its legendary name from the natural surroundings of the Appalachian Mountain foothills and the desire to provide a natural environment for people to live in harmony. Greystone is in the City of Hoover, affording excellent schools. Directions: Greystone Founders: Take Highway 280 East. One mile past Meadow Brook Corporate Park, turn left onto Hugh Daniel Drive and continue for one-half mile. Greystone Founder's entrance is on the left. Tell the guard you are looking at real estate. Directions: Greystone Legacy: Take Highway 280 East. One mile past Meadow Brook Corporate Park, turn left onto Highway 119 and continue for 2.5 miles. Greystone Legacy's entrance is on the right. Tell the guard you are looking at real estate. View of Legacy Golf Course.